A popular and proven design, Flat Top Bike Hoops offer high quality security and practicality in bicycle parking. With a two bike capacity and the option of a stainless steel finish, this product is an economical and space friendly choice for cyclists. Like the Hoop Top model, the Flat Top Bike Rack is perfect for the base of inner city locations such as offices and residential areas, but can be equally convenient in quieter environments. Manufactured in Australia using galvanised steel, it supports the entire frame of the bike and can be installed by Australian Bollards in a variety of formations to best suit the customer. The Flat Top Bike Rack measure 800mm x 850mm. At NJM Group we are committed to providing products and services of a high quality that consistently meet our customer expectations and industry standards. Our Flat Top Bike Racks have been tested and are compliant with Australian Standards AS2890.3 for Bicycle Parking Facilities. They can be installed on our locally manufactured bike shelters or crash rail containment barriers as well as being complimented by our fixed bollards for further protection against vehicles that may be parking close by. 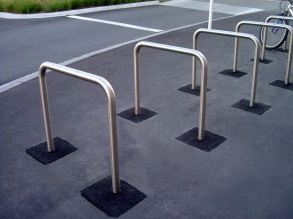 Australian Bollards can offer a customised solution to suit your bike storage needs.